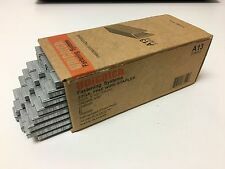 Price is for 1 (One) Box of 10,000 staples (ten thousand) This is the best bargain for Type "T50" staples. Compatible with Arrow T50, and many other types of heavy-duty stapler. Please ask about bulk pricing - I have 400,000 staples altogether (2 cases of 20 boxes each) Photos are of the actual item you are purchasing. Unicatch A13 (similar to Senco A08 series staples) - 3/16" Crown - 1/2" Length - 10,000 per box - Finish: Galvanized. Hog Ring C22 Staples. 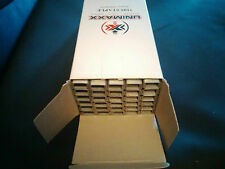 1 x Hog Ring C22 Staples 10000 in a Box. 10000 staples in Box. This is theonly communication line we use. We warrant that the item is in the condition described above. While great care is taken, any errors or omissions in the item details are unintentional. 1 1/4" Crown. 1 box @ 2,000 quantity per box. Go here for 20,000 ct. Go here for 16,000 ct. Go here for 12,000 ct. Go here for 10,000 ct.
FOR EXCLUSIVE USE IN ARROW T18 TACKER. 7/16" (11MM) MONEL STAPLES. ARROW FASTENERS. PRECISION MADE. SHCR5019 Staples. dsspo or 30d 83506 case. 3/8″ Galvanized Staples. 3/8″ Staples. 100,000 staples per case. Trending at C $138.02eBay determines this price through a machine-learned model of the product's sale prices within the last 90 days. Paslode Part No. Experience old fashioned friendly service and advice. We look forward to serving you! Length : 25mm. Gauge : 18 Ga. Specifications: - Unicatch CS06 C series staples -3/8" Crown -1/4" Length -10,000 per box -Finish: 304 Stainless Steel. Ramset 00794-1524 3" Plated Drive Pins 20-PK ! NOP ! What are you waiting for?. Arrow 3/8" T-18 Staple Features. - For use with Arrow staplers. Make sure you write your RA # on the box and include all paperwork. HNS Tools was created to expand beyond our core B2B success and give everyone access to our high quality products at low prices. Spotnails 87002.5 22 Gauge Upholstery Staples 3/8" crown 5/32" Long C series 076543870165. Specifications: - Spotnails 87002.5 C series staples -3/8" Crown -5/32" Length -10,000 per box -Finish: Galvanized \. Ramset R50126 2-1/2" Low Velocity Drive Pin 25-Pack ! NEW ! 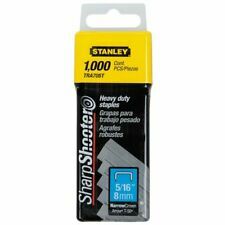 Spotnails 87004 C series staples -3/8" Crown -1/4" Length -10,000 per box -Finish: Galvanized. Not sure if they are rusted within the box. POWERSHOT 3/8" LIGHT DUTY STAPLES. CRAFTSMAN 9-68513, 09-93054. STANLEY TR45. ARROW JT-21 & T-27. YOU WILL BE RECEIVING 5,000 STAPLES. Senco A06BABN Staples. Senco SFW10XP-A, All A series Senco Staplers. 3/8″ Length. Works in the following tools. Specifications: - Unicatch CS13 C series staples -3/8" Crown -1/2" Length -10,000 per box -Finish: 304 Stainless Steel. Standard staples undergo a seven-point quality check to ensure they'll provide dependable, easy stapling performance. Sharp chisel point easily penetrates papers for less jamming. Durable construction is less likely to misform for consistent stapling. 1,000 Nails per Box. These Nails work In Bostitch Models; F21PL, N88RH, N88RH-2MCN, N79RH, N95RHN. Plus many others that require 20,21,22 degree full round head nails. RING SHANK. Full Round Head Plastic Collated at 21 Degree Angle. 20d 85506ss 5m. Spotnails 85000. Arrow T 50. Arrow T-50, HT-50. Rapid A 11. Style staples. Rapid A-11, 54. 3/8″ Crown. 1 1/4" Crown. Go here for 20,000 ct. Go here for 16,000 ct. Go here for 12,000 ct. Go here for 10,000 ct. Go here for 6,000 ct.
2 x boxes 10,000 staples genuine duo-fast staples. 5/16" x 1" 20 gauge chisel point. Boxes Have Exterior Wear. Staples May Have Imperfections Due To Age. Model:NR 90AD. Hitachi Clipped Head Nailer. Good to Very Good Condition. Direct Deposit. Money Orders or Bank Issue Cashiers Cheques (Australia Only). NOTE: We will. SORRY - No personal cheques. Cash on Pickup. F or Dewalt, Bostitch, Stanley, Arrow that use T50 staples. Arrow Fastener T50 1/2" staples. 1 3/4 ” x. 083″ Screw Shank Nails. Great nails for pallet, box building, sub floor, roof decking, decking, fencing, sheathing. 3,500 Nails. These nails will fit the following tools Porter Cable: Coil 250. Paslode GSI16 Series & DuoFast 7600. Duofast 7600 and Paslode GSI16 Series Staples. Paslode GSI3150. 5,000 STAPLES. These Staples will work in the following tools. 7/16″ Crown. STAINLESS STEEL. Plus many others designed for. 1a cw3d083rg 3.5m 10 coils. Electro Galvanized. 1 1/4″ x. 083″ Ring Shank Nails. Great nails for pallet, box building, sub floor, roof decking, decking, fencing, sheathing. Coil Nails. 3,500 Nails 10 Coils. Paslode: 3150-S16, 3200-S16, 3200-S16P, IM200-S16, MA-S16L, S200-S16, PA-200. Dewalt: D51431. 16 Gauge 1/2″ Crown Staples. Great Staples for bridging, component assembly, sheathing, decking, cedar and shake shingles, sub-floor, aluminum and steel composition siding. Senco SQS55XP, M3, SQS55. 5,000 Staples. 7/16″ Crown. 1 3/4″ Length. Hot Dip Galvanized. 30° Stick Framing Nails – Paper-Tape Collated – Primary applications include Framing, Sheathing, Subfloors and Roof Decking. Ring Shank. Clipped Head for larger magazine nail capacity. Arrow Genuine Heavy Duty Fastener Staples #609. -Parker TR70, TR75, TR80, TRE100, TRE50,& TRE200, Ace Hardware 22084, 22087 & 27175, Black & Decker Models 9700& 9701. Communications: We try to answer all inquiries promptly. 1,500 Nails. These Nails work In Bostitch Models; F21PL, N88RH, N88RH-2MCN, N79RH, N95RHN. Plus many other nailers that require 20 21 or 22 degree plactic collated nails. Full Round Head Plastic Collated @ 21 Degree Angle. Crown Width 15 Gauge in Galvanized. Fastener Gauge 15. Uses 15 Gauge C RING 3/4" OD C-ring Closes to 5/16" - 27/64" ID, WHEN YOU USE # SC7E GUN. Ring Type C. Ring Size 3/4". Use For Mattress, Car Seat. Spotnails FS4825,WS4840, WS4840W2,TS4825. Senco SLS20, SLS25XP, SKS-L, SKSN4450, KMN4450, LN4450, SLS18, Finish Pro 2n1. These staples work in the following tools. Plus many others that require 18 gauge 1/4″ crown staples. STCR5019 9/16-4M Power Crown Bostitch Staples - "" 2 Boxes """